Itching for some fluffy and moist buttermilk pancakes but would just rather grab a box of premade pancake mix because it’s easier? This make ahead buttermilk pancake mix recipe is just what you need! Make up a batch and keep it tucked away in your fridge until you’re ready for some of the most scrumptious pancakes you’ll ever eat. Whisk all ingredients together thoroughly and place in an airtight container. Store in the fridge until ready to use. Measure 3 cups of dry mix into a large bowl. Add 1/2 C milk, 2 eggs, 2 C warm water, and 1/2 C melted butter (melted and cooled for a few minutes before adding). Whisk until just combined and fairly lumpy <-- lumps will disappear in the finished pancakes. Heat a non-stick griddle to medium and use a 1/4 C measuring cup to portion the batter onto the pan. Cook until the bubbles around the edges pop, flip and continue to cook an additional minute or until done to your liking. 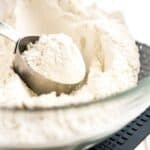 Dry powdered buttermilk can be found in the baking aisle at most grocery stores. I like to use it in this mix because I rarely have fresh buttermilk on hand when I have a craving for pancakes. Once opened the dry buttermilk does need to be refrigerated however, causing this mix to need to be stored in the fridge until ready to use. I understand that not everyone has enough room in their fridge to store 3 batches worth of pancake mix, so you can omit the powdered buttermilk in this mix if you'd like to store it in the pantry. When you're ready to make pancakes just omit the water called for and add 2 C of fresh buttermilk instead.